In constellation Cygnus the swan, about 600 light years away from us, sits an amazing planet that could have continents, oceans and creatures already living on its surface, a place that is just right in meeting all the requirements for life, Kepler 22b. We knew about Kepler 22b since 7 Dec. 2011, when NASA’s scientists confirmed and validated the planet after 22 month period of observations, Kepler 22b was the first planet in the “habitable zone” of it’s star to be discovered. Remember, we refer to the habitable zone as a region around a star where a rocky planet could have a surface temperature between the freezing point and boiling point of water, the region where liquid water could exist on a planet’s surface. Kepler 22b orbits around a star like our sun, a bit smaller and colder, every 290 days; its 15% closer than the Earth is from the Sun. Scientists’ models suggest the planet has comfortable average surface temperature of 22°C (72°F) which sounds remarkably clement. As such temperature, the planet is warm enough that it could have liquid water on its surface or even large ocean, as some researchers suggest. said Natalie Batalha in an interview. Since March 2009, astronomers use Kepler Space Telescope to hunt for exoplanets, planets beyond our solar system orbiting stars other than the sun. Kepler Telescope is a NASA space probe specially designed to survey our region of the Milky Way looking for alien worlds that resembles our planet, located in or near the habitable zone of their host stars. Kepler is our best instrument that allow us to glimpse into far distant realms, hunting for potential Earth-like planets in our galaxy, the Milky Way. The telescope is staring intently at 155,000 stars in the region of the constellations of Lyra and Cygnus, looking for tiny drops in brightness over time. If a planet passes (“transit”) in front of its parent star, we see a small dip in star’ brightness as the planet dimming it’s light by a minuscule amount — this is called by astronomers the transit method. In order to confirm if a planet is actually true, Kepler requires at least 3 transits to verify a signal as a planet. Up to June 2016, Kepler has confirmed more than 2,350 exoplanets and even twice waiting candidates; among them are 207 Earth-sized planets but just 21 are small, located in the habitable zone. said then William Borucki who led the team that discovered Kepler-22b. The first transit was captured just three days after we declared the spacecraft operationally ready. We witnessed the defining third transit over the 2010 holiday season. Based on the 3 transits observed in the 22-month period between 12 May 2009 and 14 March 2011, Kepler 22b has been validated. By December 2011, NASA was able to confirm Kepler-22b’s existence and announced it as part of a larger press conference. Can the Kepler 22b support life? We actually don’t know, the planet is too far away to scrutiny this world but it’s reasonable to suggest that having liquid water on the surface of the planet would make a good start. As the planet is located withing the habitable zone & with an average temperature of 22°C the planet is pleasantly warm and thus liquid water could be there so it can be included in a list of “optimistic” habitable worlds. However, some researchers put in question the habitability of this planet, indicating that Kepler-22b, is far from a twin to Earth. Transit observations allowed scientists to determine the planet’s size and it turns out, Kepler 22b is around 2.4 times the radius of Earth — That’s roughly half way between the size of Earth and the size of gas giants Uranus and Neptune. So what is that mean? Kepler 22b is most likely a super-Earth and probably has a thick atmosphere which, in turn, probably means the true surface temperature will be higher than the optimistic 22°C. Indeed, if the atmosphere of the planet is sufficiently dense, and rich in greenhouse gasses, it might well be more like Venus than the Earth, with a surface far too warm to house liquid water. Explained Jonti Horner, Post Doctoral Research Fellow, UNSW Australia. But again, we don’t know… More data on Kepler-22b is required to determine if the planet is a rocky planet with large ocean or a planet more like Venus or Neptune. But if Kepler 22b is more like Earth then how far is it? Well, Kepler 22b is 600 light years that’s 3,527,175,223,910,165 or three and a half quadrillion miles away. Even if we could make somehow a ship that could travel at speed of light it would take 600 years to reach Kepler 22 star system. But what about our current technology? The fastest man-made object is Voyager 1 with some 17.05 kilometers per second; with such spacecraft it would take well over 8,400,000 years to reach it, clearly we need something like a worm hole to shorten the distance. 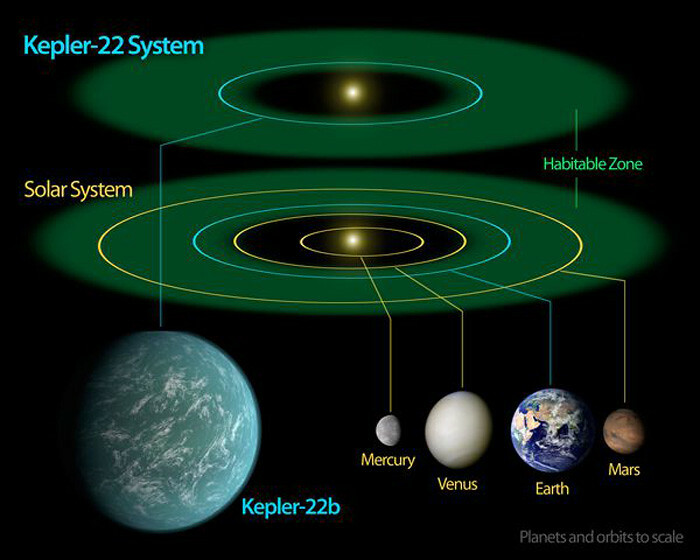 New perspective of life in Kepler 22 system? In 2013, there was a study that suggested Kepler-22b to have an exomoon large enough to maintain an atmosphere, a telluric world with a great potential habitability. But, a few month later, a study shows no evidence for such an exomoon. Since then, Kepler 22b has been completely forgotten, thrown in Kepler’ archive thus nobody further worked or examined it. Many others potential habitable world rose up, some even much closer to our planet like Gliese 581d, Gliese 667 Cc and others. But for us, Kepler-22b existence is still actually a huge and a very exciting surprise, who knows, maybe in the future, scientists will focus again on this forgotten world. The more data we collect, the keener our eye for finding the smallest planets out at longer orbital periods. I’m not going unless they have a Starbucks every 100 meters.